One of the biggest challenges in course design is creating a course consistent with the organization’s learning objectives. Often courses are built around fuzzy objectives where the expected outcome isn’t quite clear. Another issue is that the course doesn’t end up meeting the objectives. Why is the course being built? What is expected after the person takes the course? Understanding this helps you create learning objectives to meet the course’s goals. Often organizations don’t have clear goals or the goal isn’t based on immediate performance expectations. For example, many organizations require that employees take annual ethics training. It’s not like they hire a team of unethical employees who’ll take the course and all of a sudden be ethical. In that case, an immediate change in behavior isn’t the real goal. What they want to do is reinforce and remind the employees of the organization’s ethics policies and expected behavior. That’s an information course. And often those types of courses only require end-of-year certification. So the objective is relatively simple: certify familiarity of the organization’s policies by December 31. On the other hand, if the desire of the organization is to change behaviors or impact performance than the objectives are different. That’s a performance course where the learning objective is measurable change. They were at point A and after taking the course they’re at point B. With an identified action you can measure the effectiveness of your course. On the other hand a fuzzy objective like “you will understand how to do something” it’s hard to measure and see it in action. Move a step close by detailing what “understanding” is and how you can see it in action. If a person understands something what are the expected actions? Often we’ll list the learning objective as a larger goal. 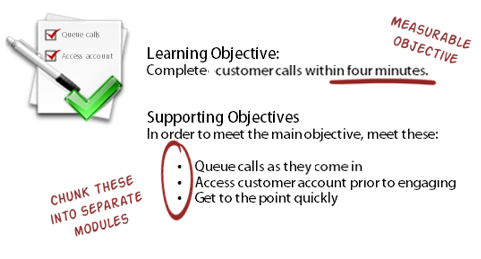 For example: the objective is to complete customer calls within 4 minutes. That’s a good, basic objective and it’s measurable. I can start with how long it currently takes to complete calls and then track the improvement after the training. However, to complete the calls in less than 4 minutes usually requires other actions. Perhaps it means that the call is manually sorted into a queue to speed up processing. Or perhaps the customer’s account information is visible prior to engaging the customer. Meet the larger learning objective is contingent on meeting a number of smaller, secondary objectives. The person who handles the customer calls actually will meet the 4 minute mark if they are successful with those other activities. List your main learning objective. Then make a list of all of the required actions to accomplish the main learning objectives. 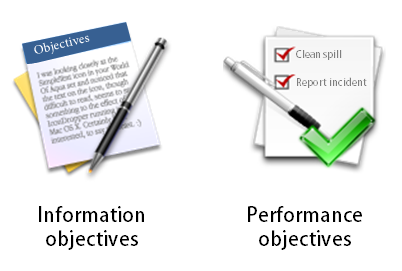 These actions are your supporting learning objectives. When building courses in the past, I would chunk the supporting learning objectives into smaller modules. They were faster to create and easier for the learners to digest since the modules were more specific and smaller. However you go about creating learning objectives, the key is to really understand what the organization wants and then build objectives to meet those goals. This helps you spend your resources in the right place and ensures that you are moving things forward. What do you think is the most challenging when identifying your course’s learning objectives? Robert Mager wrote the book on instructional objectives 50 years ago that supports your idea of action. 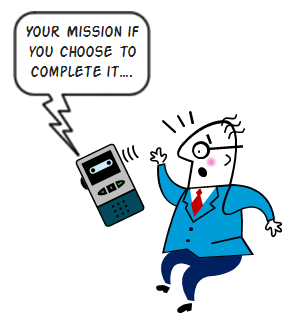 One thing that we almost never see in objectives is the evaluation. The conditions, method, and criteria for evaluation should be specified as part of the objective. Coming from a teaching background, I have always been fundamentally opposed to using the word ‘understand’ in a behavioural objective.After all these years I feel vindicated in my belief! It is extremely difficult to measure a participants understanding of a concept or skill, but you can always measure what the know or are able to do. When I am struggling with wording objectives, I alwasy refer to Bloom’s taxonomy of learning domains to help! Sound advice as usual Tom. Beware the Knowledge Objective pretending to be an action objective. E.G. Outline the steps to be taken when performing brain surgery is not an action objective. Similarly: list, enumerate, describe etc. often look like actions but are often about knowledge. While I’m certainly no expert when it comes to writing learning objectives myself, the biggest challenge I face is looking to update learning objectives for existing material that either had no real objective to begin with or used “understand” at the start of each one. I try to explain the concept of behavioral changes and measurable outcomes, but still receive similar “revised” objectives. I know everyone really does have the best of intentions. It’s just hard to make that shift and I’m fairly new here still. Someday! As always, your blog posts are such a valuable read. I’ve learned so much from you since visiting the Articulate site for the first time last summer. Thank you! — They can’t accept that what they’ve done for years was less-than-stellar. No one wants to admit they aren’t perfect and that there is a better way. — It really IS HARD to write good objectives. So it’s easier for SME to just skip that work. — SME don’t know what they don’t know. Their subject is not only everything, it is the only thing. They just can’t wrap their heads around learning something from a non-SME person. SME don’t trust the field of instructional design or pedagogy and do not truly respect that expertise (though they will occasionally ooh/ahh over some multimedia product you create for them). I resolve this frustrating by remembering that I, too, must have some big blind spots and need to be more and value other people’s unique skills and knowledge areas. In my opinion, the more concrete the learning objective (and supporting objectives), the easier it is for employees to “digest” the content. In training swimming instructors, it is much easier to create objectives for improving parent involvement than it is for improving critical thinking skills when making corrections. The first involves only one layer – behaviors directed at the parent (e.g. waving, smiling, thumbs up from child). The second, however, involves several prioritized layers, like a decision tree (e.g. the child’s body position, power/momentum, technique, breath control). 1. How much time do we have? 3. In what way can the content be chunked to make learning easier? 4. Is there a model (writing, audio, video) of successful mastery? I think you must first need to evaluate who will be the one taking the course. In this way, you will know what their needs and wants. In there, you can set the learning objectives. And after they finished the course you can ask them some kind of testimonials like what they have learned and if there are any suggestions or comments. Its one of the greatest post with having lot of information. Thanks for such important post. Just keep posting for the readers.